One of the best words you could use to describe me is spontaneous. Some of the best experiences I’ve had so far in life have been due to my spontaneity. Lucky for me, I have an equally impulsive sister and boyfriend, who are my travel partners in crime. Last summer my sister and I booked flights to Miami on a Saturday morning at 11 am and flew out of LAX that evening at 11 pm. This past February, I found roundtrip flights to Vancouver from LA for $45 and 2 weeks later, I was in Canada for the first time. I’m not much for planning things out, but prefer to be adventurous on a whim. For Memorial Day, I had planned to go to the beach with my sis and boyfriend, until along came Tropical Storm Bonnie. Not wanting to spend my entire weekend watching it storm on an East Coast beach, my sister and I decided to go to Chicago instead. We booked our flights on Thursday night and left Saturday morning. This was my third trip to Chitown and my sister’s first. I fell in love with Chicago the first time I went (for Lollapalooza 2013) and would absolutely live there if it were not for the detrimental winters. All of my visits have been during the summer, when the weather is sunny, hot, and as usual, windy. I wouldn’t last one day during the winter. 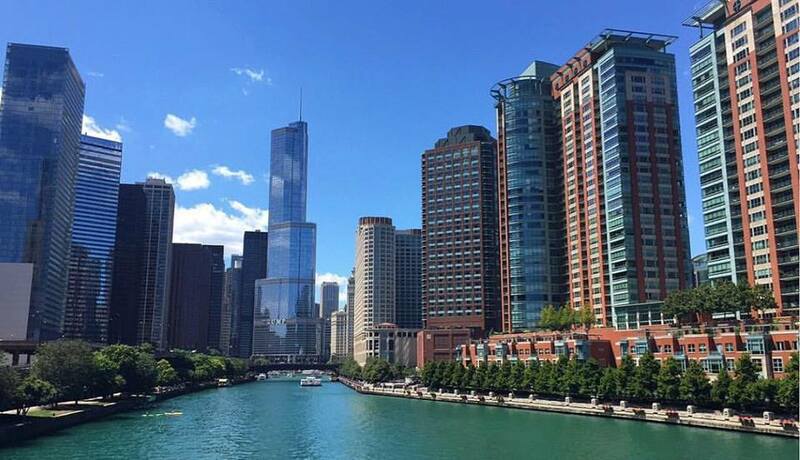 Next stop on Saturday was the Architecture Riverboat tour, an hour and a half tour along the Chicago River, highlighting the historic and world-renowned architecture throughout the city. The weather was perfect and the boat has a full bar. Afterwards we hopped on the L and got off in Wicker Parker. We walked up and down Milwaukee Avenue shopping, getting tarot card readings, green juice, and dinner at Xoco Bistro, a Mexican restaurant by Chef Rick Bayless. Sunday morning we had breakfast at the Chicago Athletic Club, an upscale hotel on Michigan Avenue, across from Millennium Park. We ate at the Cherry Circle Room then headed upstairs to Cindy’s Rooftop, where you can see all of Millennium Park and the infamous Bean. We went across the street and joined the swarms of people trying to take selfies in the Bean and were quickly over it. Our next stop was Lincoln Park. We checked out the J Parker, a rooftop with awesome cocktails and a nice view of the park and beach. We ate pizza and fried cheese curds (something that is apparently popular all over Chitown) in Lincoln Park before heading back to our hotel. We very stupidly saved the most tourist-y part of our trip for the last day which happened to be Memorial Day. Julie and I, almost with hundreds of others, showed up to the Skydeck at 9 am. We waited in line for hours to get to the top, 103 stories above Chicago. 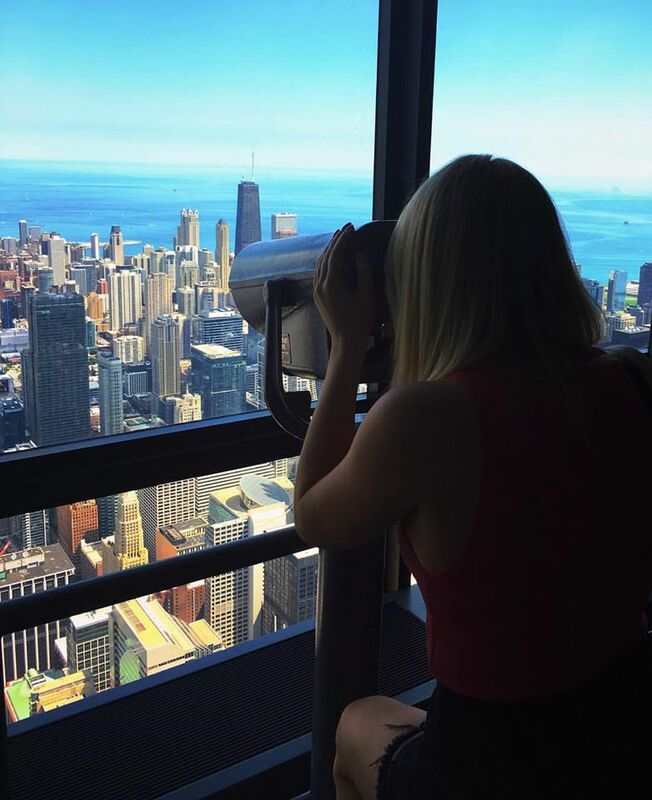 Once you arrive in the Skydeck, there are more lines in order to take pictures on the “ledge.” We got our pictures and I can’t decide whether it was worth those hours off my life (be the judge and let me know). What I love about Chicago is how clean, calm, and normal it feels. My favorite part of the city is the beautiful Riverwalk, especially at night. My recommendations include the Architecture tour, Cindy’s Rooftop, and Bohemian House for lunch. I can’t wait until my next trip. Until then, comments, suggestions, and questions are welcomed and appreciated. :) Subscribe to receive email newsletters and follow me on Instagram to stay up to date on my latest posts!